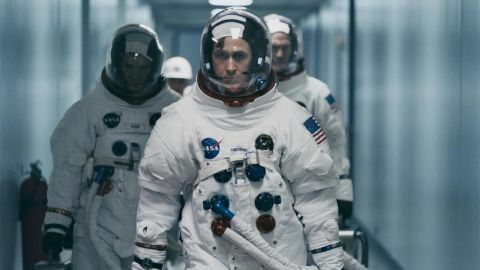 First Man review: "Gosling and especially Foy are out of this world"
Chazelle broadens his horizons with this superbly detailed account of the Moon landing. Gosling and especially Foy are out of this world. What does it take to be the first man on the Moon? It’s a question that Damien Chazelle’s First Man asks in the subtlest of ways. Telling the story of Neil Armstrong, the man who first stepped out of Apollo 11 in 1969 and into the history books, Chazelle’s fourth movie is utterly surprising. If Whiplash and La La Land, his second and third films, were both exuberant love letters to jazz and the Hollywood musical respectively, this is a more buttoned-down, but deeply authentic salute to Armstrong and his NASA colleagues, who risked their lives to win the space race. Reuniting with his La La Land director, Ryan Gosling plays Armstrong. For an actor who loves to internalise, keeping emotions below the surface, the taciturn astronaut is seemingly a role that fits him like a space glove. When we first see Armstrong, it’s 1961 and he is flying the X-15, a hypersonic rocket-powered aircraft capable of making it to the cusp of outer space. He returns to Earth and the Mojave Desert with a bang. “Kid’s a good engineer, but he’s distracted,” says one of his colleagues. It’s this ‘distraction’ that Chazelle explores, although not in a way you might expect. Armstrong is not a head-in-the-clouds type, dreaming of conquering the universe. Instead, he’s a pragmatic family man – one who’s contending with his youngest child Karen’s (Lucy Stafford) terminal illness. The script by Josh Singer (The Post, Spotlight) doesn’t linger on her suffering, but its impact resonates all through the movie. Unable to talk to his wife Janet (Claire Foy) or any of his friends about his crippling loss, Armstrong remains on emotional lock-down throughout. Maybe it’s this ability to shut everything else out – the horrors of losing those closest to you – that aids Armstrong in performing the most complex functions under the highest pressures in space. His laser-like focus never comes into question. But his ability to communicate with his family certainly does. “You don’t have anything under control,” yells the exasperated Janet, who in one of the finest scenes in the film forces her husband to talk to his kids, Ricky and Mark, about the very real possibility that he may never come back, when all he’d rather do is quietly pack his suitcase. Spanning the eight years leading up to the Moon landing, Chazelle’s film carefully plots out the trials and tribulations the NASA geniuses face - the technological breakthroughs and breakdowns, not to mention waning public support for an exercise many believe is costing millions in taxpayer dollars. With Armstrong joined by fellow trailblazers Ed White (Jason Clarke) and Elliott See (Patrick Fugit), the first half concentrates on Project Gemini, as techniques to aid the Apollo mission – such as docking a lunar craft and the mothership in space – are developed. Ambitious and artful, the action scenes are beautifully realised, with the help of Linus Sandgren’s cinematography and production design from Christopher Nolan’s regular collaborator, Nathan Crowley. Indeed, a line can surely be traced between Nolan’s Interstellar and Chazelle’s movie, which similarly treats the space race with the seriousness and emotional power it deserves. Credit is also due to Justin Hurwitz, Chazelle’s regular composer (he bagged two Oscars for La La Land), whose throbbing, tense score propels the narrative. As we get ever closer to the main event, Chazelle avoids turning First Man into a platform for rampant US flag-waving. Instead, what lingers is a sense of melancholy, as you’re left wondering just what personal sacrifices Armstrong – and those that didn’t make it to the Moon – had to make. The Eagle may well land safely, but don’t expect any swooping notes of triumphalism. Just a little bounce around the Moon’s crusty grey surface, as Armstrong and fellow astronaut Buzz Aldrin (Corey Stoll) make lunar history. While Gosling is tightly wound, not unlike his character in Drive, there’s a more demonstrative, show-stopping turn from Claire Foy, the woman trying to hold their family together. “I married Neil because I wanted a normal life,” she says, although there seems little hope of that. Whether some will take to this blend of kitchen-sink drama and science fact remains to be seen; it may not thrill those looking for the unadulterated highs of Chazelle’s earlier movies. But even with the director aiming for sombre realism, you’ll be left in awe of what Armstrong and his peers achieved.